Location: Louveciennes, in the Yvelines departement of France (Ile-de-France Region). Notes: Château Louis XIV is a castle built between 2008 and 2011 in the town of Louveciennes in the Yvelines. Although it is a new construction, the Chateau Louis XIV meets the specific canons and rules of proportions and ornamentation from ancient times, as they were regularly taken during the seventeenth century. The Chateau Louis XIV is a construction project undertaken by the COGEMAD company in 2008, following the techniques and materials used in the seventeenth century. The construction method is that of castles built in the seventeenth century on a greenfield site and using mainly the time techniques as known in France. 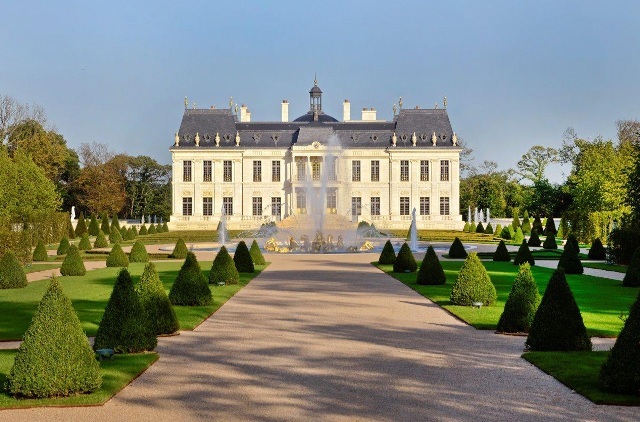 Located between Versailles and Marly-le-Roi on a property of 23 hectares enclosed by walls, the Château Louis XIV, energy efficient building, is surrounded by a moat and consists of 7000 m built more than 5000 m of living space. Sale, conducted by Christie's International Real Estate network in December 2015, has the world's largest real estate transaction for a private residence. The project is based on an idea Emad Khashoggi (in), founder of the company and restaurateur COGEMAD palace Rose Vésinet listed monument and Verduron the castle in Marly-le-Roi. Built on the property of the former castle of Camp Louveciennes, Château Louis XIV, only castle in France for over a century, is a new building with all the comforts of the twenty-first century, while retaining the look , scheduling and materials of the seventeenth century. It is the work of the leading specialists of crafts, often artisans who received Label_Entreprise_du_patrimoine_vivant label and working almost exclusively for historical monuments.